The history of the 76th FS dates to the earliest days of World War II. During the summer of 1941, Claire Lee Chennault formed a small group of American pilots into three fighter squadrons, the American Volunteer Group, of the Chinese Air Force. 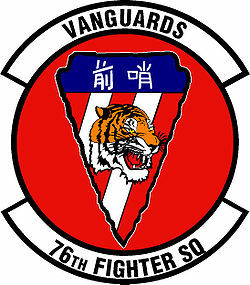 The unit immediately garnered international attention for their combat successes while defending China and Burma, and the 76th became known as the Vanguards, part of the “Flying Tigers.” Some members of the AVG joined or rejoined the United States Air Force after the AVG was disbanded. After World War II, the squadron performed air defense intercept operations in Guam, 1946–1949, in Panama, 1949, and at various bases in the eastern United States, 1955-1963. They trained in and conducted close air support operations, 1972-1992. Portions of squadron deployed to Saudi Arabia in 1990 and took part in operations against Iraq in early 1991. Beginning in December 1995, the 76th assisted other units to integrate space product applications into current operations procedures. They deployed personnel to air units worldwide to enhance their links to space assets. Provided counter space capabilities to war fighters worldwide, 2001-2008. In February 2009, the 76th was re-designated as a Fighter Squadron at Moody AFB, GA and became the Air Force’s lead unit for Total Force Integration between reserve component and active duty A-10 units. The move would reunite the original “Flying Tiger’s” of 1941. The members of the 76th have supported Operation Enduring Freedom in Afghanistan alongside the 74th and 75th Fighter Squadron’s since 2009. Ding Hao!